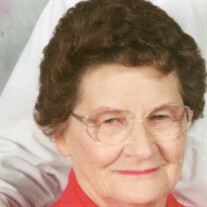 Gertrude Lavonne (Conger) Clark was born at Red Owl, South Dakota to Troy Ellsworth "Bun" and Elizabeth Amy "Betty" (McGinnis) Conger on February 26, 1931. She attended country schools riding to and from on horseback with her siblings. She graduated from Sturgis High School in 1948 and later took a job in Sundance, Wyoming. It was there she met her future husband, Charles Clark and they married October 30, 1948. They lived in the Sundance and Spearfish areas where Charles worked for Homestake and Driskill cattle company and she was a homemaker. They moved to Newcastle in the early 1960's and soon after bought the home they lived in for the remainder of their lives. She was a great homemaker and mother. She and Charles were involved in starting an organization dedicated to meeting the requirements of special needs children in the Newcastle area. She later managed a meat processing plant very near her home where daughter Gerry could accompany her to work and later at the Slatewood Inn preparing salads for their salad bar. She started her last job (lasting more years that we can remember) with Salt Creek Water District as their bookkeeper. This job lasted until her retirement in 2015. She was a member of Weston County Cowbelles for many years and always enjoyed their projects and the friendships formed there. At home she liked to sew and mended untold numbers of Levis and shirts for Charles and her grandsons. She was able to make clothes for her daughters by cutting her own patterns from old newspapers. Her last sewing projects were hand made baby quilts given to new members of family and friends. When December came each year she was busy making Christmas candy which was also shared with family and friends. Lavonne passed away in Gillette, Wyoming as a result of pneumonia after an extended battle with her fourth diagnosis of cancer. She is survived by her daughters Gerry Clark and Shirley (Larry) Cole, Newcastle, grandson Scott (Terra) Johnson with great-grandsons Christopher and Tanner, Newcastle and grandson Steven Johnson, Wheatland, Wyoming. Also surviving are four sisters, Ardeth Hunt of Sioux Falls, SD, Ginger Koster, Piedmont, SD, Jackie (Bob) Dale and Angela (John) Ross both of Sturgis, SD. She is also survived by numerous nieces and nephews of both sides of her family. She was preceded in death by her husband Charles, parents Bun and Betty Conger, older brother Albert Conger and infant twin sisters Lois Adell and Laura Aileen. Services will be held at 2:00 PM Wednesday, August 8, 2018, at the First United Methodist Church, with internment to follow in Greenwood Cemetery, Newcastle, Wyoming. Memorial contributions in Lavonne's name may be made to Helping Hands Foundation of Weston County.